So much happened in the early 1970s in the period leading up to Papua New Guinea’s Independence in 1975. Institutions such as UPNG, UNITECH, Administrative College, and the Goroka campus of UPNG were hubs of cultural and political consciousness. Students at the University of Technology in Lae contributed their folktales to the student yearbook called Nexus between 1970 and 1971. In 1978, Stokes published a representative of these stories as retold by Barbara Ker Wilson in The Turtle and the Island. The Oxford University Press published a later edition as Legends from Papua New Guinea: Book Two (1996). These young writers heard these folktales as they grew up in their villages. The student wrote their stories from their memory. These stories give explanations, moral lessons, and descriptions of the natural beauty of landscapes, cultural values, explanations of the mysteries of nature of things, and about the intricate relationships humans have with the natural, physical, and spiritual environment. These university students realized that cultural maintenance, self-explanations, and collective consciousness are defined by their different cultural and language backgrounds. If they are to live together as a society they need to teach each other their own cultures. Cultural nationalism begins when those who consider it important enough to privilege it against the pervasive foreign cultures. These pioneer higher education students recognize the need to provide their own cultural explanations of the world and their social relationships with each other. They used stories from their own societies to explain their cultural background and explanations of the world. They also learned from each other the importance of cultural diversity, cross-cultural fertilization, and multiple explanations of the world. They treasured the folktales from their societies. 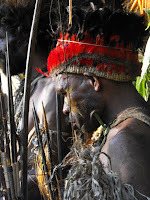 One of the stories in Legends from Papua New Guinea captured my attention. “The Great Flood” written by Adam Amod, from Ali Island near Aitape, in the Sandaun Province explains how the Ali Islanders settled on the island and their relationships to Tumeleo and the mainlanders of Aitape. The flood story had spread across the Sepik region, though the flood myth is also a universal one as documented in Allen Dunes book, The Flood Myth (1988). The Ali Island version begins with the villagers killing a talking eel who had warned the villagers to remove the fish poison (Walamil) used to kill fish for a mortuary feast in the village. The eel was carved up and distributed among the villagers. The head part of the eel was given to a young boy. The head of the eel warned the boy not to eat it and instructed him to tell his parents what to do. The father planted the eel’s head near a tall coconut tree, dug a hole near the tree so that the boy and his mother can take shelter from the flood commanded by the eel. The flood destroyed the entire village, except for a neighboring village tribe known as Yini Parey, on the way to the feast. The Yini Pareys were swept away by the flood on a breadfruit tree, ending up on a reef that became known as Ali Island. The boy’s father had climbed the coconut tree as instructed by the eel. The boy and his mother remained sheltered in the pit near the tall coconut tree. The father, Kairap, ate coconuts to remain alive in the tree. To see if the flood had receded he threw three coconuts down from the tree. The first two coconuts sank into the water. The third coconut touched the hard surface of the earth. The smoke rising from the pit where the boy and his mother took shelter confirmed that the flood has subsided. The flood myth is about the arrogance and foolishness of villagers in observing the link between humans, the natural world, the animal kingdom, and the spiritual worlds. Knowing and respecting this link is the key to a balance in nature and the world. Human carelessness and lack of respect of nature lead to ecological catastrophe in the world. Another key element in this story is about the genealogy and migration of people across vast land, rivers, and sea. In the Ali Island version we learn how and why the Ali Islanders had moved from the mainland to settle on the Island. It also tells the story of how the survivors of the flood had come to form the basis on which generations of people from this ancestral place had come about. The myth is told with the intent to instill in younger generations about cultural taboos, their cultural heritage, and the traditional principles and values younger generations have to follow. The eel symbolically represents the ancestral wisdom and spiritual forces that guide and direct people’s lives. In my trained eye the flood myth explores the metaphor on human’s relationship with nature and through which the complex relationship of man against nature and nature against man occurs. Papua New Guineans must write down the folktales and legends of our people and for the future generations. We must write books based on our traditions and culture. I do hope many educated Papua New Guineans find the time to at least record in print one folktale or legend. We have thousands of folktales in our multilingual and culturally diverse societies. In our race with modernity we left behind the stories of our ancestors. The challenge is to link our traditional societies, our past, and our history with introduced modern cultures and traditions. The question to now is: How serious are we in capturing our oral traditions in print or electronic forms? It would make sense for the government or other developmental partners to fund research, writing, publishing, and media broadcasting programs to preserve our national treasures. Folktales will remain an important source of inspiration and medium of education if we care to acknowledge its place in our society. I appeal to authorities to fund research, writing workshops, and publications of our wonderful folklore and oral traditions instead of paying lip service in the guise of cultural promotions.